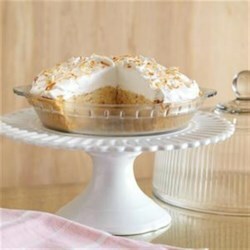 "There is no reason to decide between banana cream pie and coconut cream pie with this delicious two-in-one recipe." Dissolve cornstarch in water in heavy saucepan; stir in sweetened condensed milk and egg yolks. Cook and stir until thickened and bubbly. Remove from heat; add butter and vanilla. Cool slightly. Fold in coconut. Slice bananas; dip in lemon juice and drain. Arrange on bottom of pie crust. Pour filling over bananas; cover. Chill 4 hours or until set. Top with whipped cream. Garnish with toasted coconut and sliced bananas, if desired. *To toast coconut: Place coconut in dry nonstick skillet; cook over medium heat, shaking pan until coconut is lightly browned. It's just not setting up. I always get compliments when I make this pie. Simple yet something different. The hardest part is not burning the coconut while toasting...opps, there I go again!!! I made this last Thanksgiving and it was a hit. I love the combination of the banana and coconut. It was also very easy to make. I made this in a hurry to quench my craving and loved it !! The banana and coconut compliment each other so well. My family loved it. Defiantly making it again. It was awesome. Homemade graham cracker crust is a bonus.